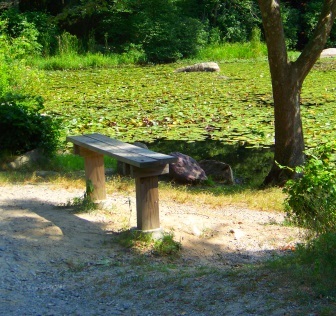 The Picture Pond Loop is a hiking trail loop that can be used as part of a multi recreational outing at Wompatuck State Park. This name is not the official name of this hiking route, it passes a small pond by this name. The loop uses the park markers of MH1, 2, 3 & 4. It could also be termed as the Mount Hope Loop. It can be started at the Campground and is a relatively short distance from it. It can also be accessed just outside of the park at the end of Mt. 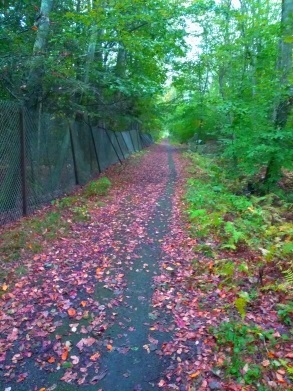 Blue St. in Norwell. 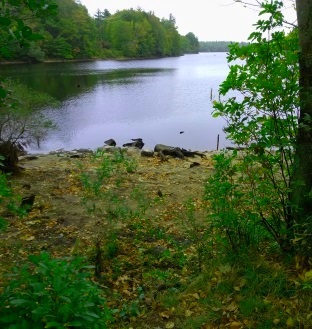 While Wompatuck State Park is generally thought to be a Hingham Park, it also encompasses parts of Cohasset, Norwell and Scituate. This route guide leads you through three of these towns. 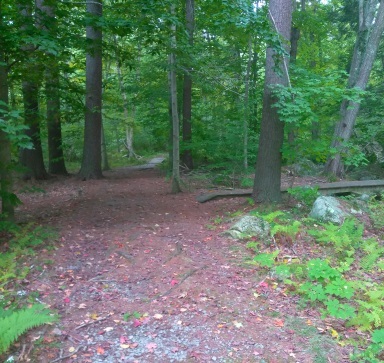 Starting at the campground which lies in Hingham, this hike brings you to the back gate where the trail begins and lies in the town of Norwell. The actual loop lies entirely in the town of Scituate and may be the only part of the park that does so. 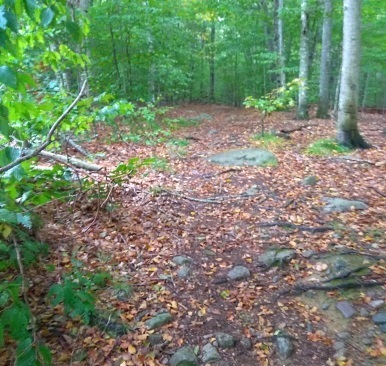 If you are camping at Wompatuck State Park and in the non electric side you can start the hike by using the trail next to the campsite marked " Y12". There is a trail marker "W7" at this spot as well. 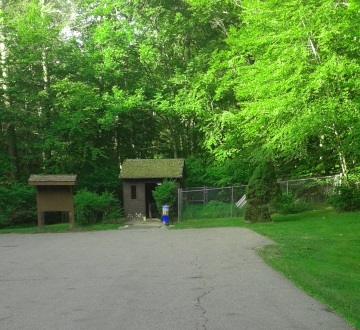 This is a mostly downhill path that leads out to the parking area at Mount Blue Spring. Continue out the parking area going right on Union St. If you are not camping either use the parking at Mount Blue Spring or continue on Union St by car as there are some roadside parking spots across from the trail. This trail is by the back gate which is always closed. Continuing on by foot at about 1/3 mile the East area of the park and it's trails will lead to the left. 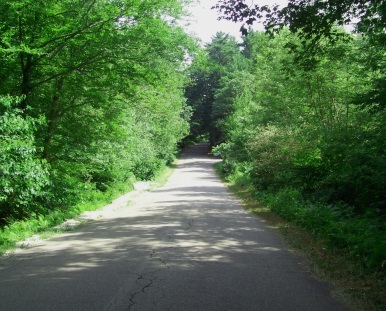 This stretch of the road is used less often and is where I found the deer that are on the main page of this website! 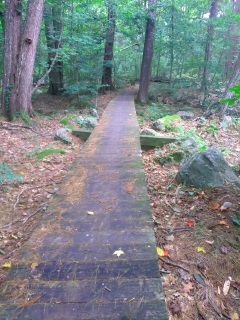 The two trails at marker S19 on Union St start with boardwalks. At just under 1/2 mile there will be a "S19" marker to the right and two boardwalk trails. 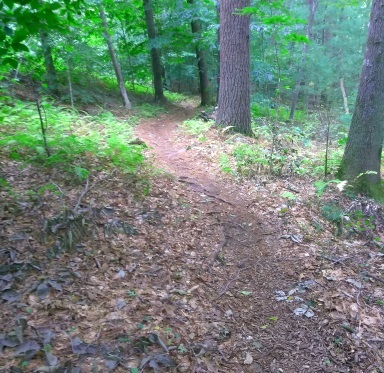 Either of these trails can be used as an alternate hiking route back to the campground. Soon the street will pass over Aaron River. Depending on the time of the year it will either be flowing or stagnant in summer months. At .56 miles we arrive at the Southern Area which is dedicated to hunting in the fall. Holly Pond is located here. There is a small pier great for fishing, a bench and bit of a beach. More for dog swimming, not very good people swimming area. The street climbs a bit, levels and comes upon Boundary Pond which is filled with lily pads in the summer. Picturesque in spring and fall. There is a bench here as well. More trails leave into the Southern Area here. At .78 we arrive at the back gate and the start of the hiking trail leaves to the left. There is a kiosk with park info located here. The MH1 marker is here at the kiosk. The hiking access trail of the picture pond loop starts narrow here on a light downhill track. 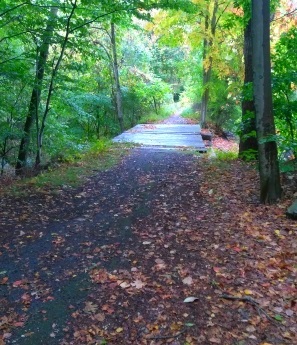 There are bits of old asphalt on the trail. It leads along the fence the marks the boundary of the park. The trail soon turns all gravel and dirt and turns slightly to the left while the fence continues straight into the forest. The trail widens out and at about one mile turns to the right downhill over a small bridge with a stream that feeds Picture Pond from the left of the trail. The trail is now narrow again leading along the side of the pond. In the summer this little pond is more a mud hole. 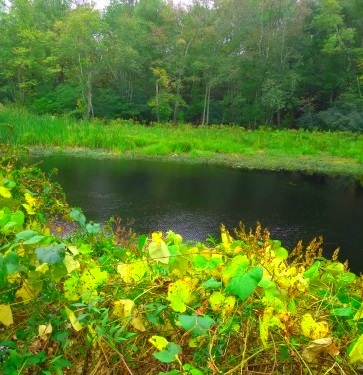 The trail along the pond is lined by grape vines. At the other side of the pond the trail splits for the loop. Marked by "MH2". Presumably the MH stands for Mount Hope as this area shows a hill by that name in this area. Here we go right heading on to MH3. This continues narrow and passes the remains of a pump house on the right. There is what looks like a circular drive left over from days past that will make you think you went the wrong way, but at the far end of the "driveway" the trail continues into the forest. At 1.16 miles the trail now widens out once again. The trail will now make a short moderate climb and meets a chain link fence, leveling and runs straight for a short distance. 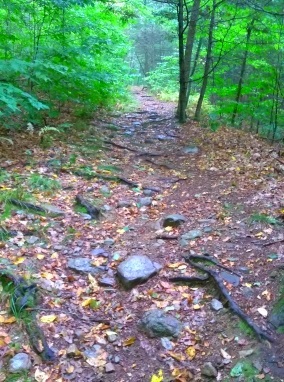 As the trail climbs Mt Hope more rocks appear. At 1.25 it will make another longer moderate climb this time with rocks and roots, and afterwards becomes a more gentle incline with the trail being lined by grass. Ferns now make an appearance and the fence is flattened by a fallen tree. 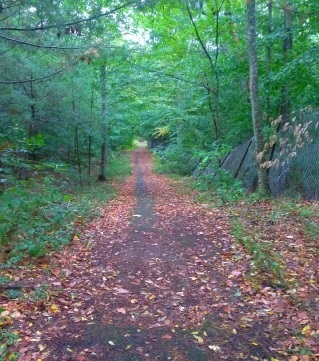 At 1.31 miles the picture pond loop which could also be called the Mount Hope Loop starts to climb again. It enters the Mt Hope area, continues climbing and then meets a utility line. It is here that we find the MH3 marker, just before entering the utility line. 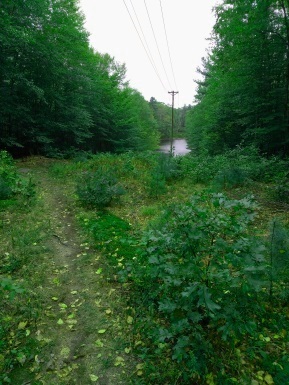 The picture pond loop goes left here, but looking to the right the utility line meets a street which is Mt Hope St if still in Norwell or Clapp St if in Scituate. 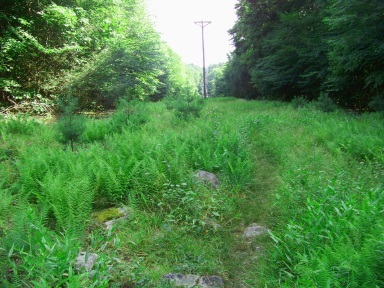 Going left the hiking trail runs through the utility line which in deep summer has a garden like appearance thick with ferns. Recent rain left small pools of water on the trail. The trail continues to very gently climb, crests and just as gently starts declining. The ferns help support a large very inquisitive dragonfly community. At 1.57 the decline gets more noticeable but not moderate yet. The trail becomes increasingly rocky. The trail levels for a bit remaining rocky and soon starts a downhill jog. There are areas of previous burn, possibly intentional to keep the vegetation down. At 1.72 the Aaron Reservoir comes into view. The trail starts a more moderate downhill decline. A trail leads off to the right. The loop continues straight. Previous explore of the trail to the right is interesting but leads to private land. Another trail created near the end of this leading out to Clapp St would be useful! At 1.82 MH4 leads to the left. The trail continues down to the reservoir edge so exploring that is irresistible! Down to the edge the trail becomes almost steep and rocky. Two more trails lead to the right. At 1.92 we reach the bottom where it is almost beach like. 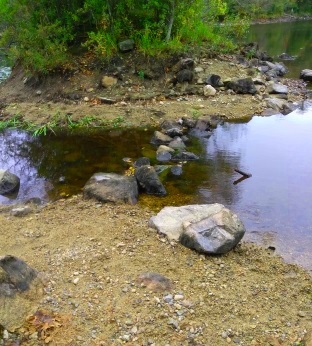 There are a variety of birds in this area and some stepping stones lead over to a small island. There is a small trail that leads up the island but it is too vegetated. One side of this island has a manmade retaining wall along it's side. Heading back up to the picture pond loop at MH4, the trail leads right and uphill gently and again rocky and rough. The trail soon levels and the roughness fades and becomes a pleasant pine needle laden trail. At just over 2 miles the trail starts a gentle decline. 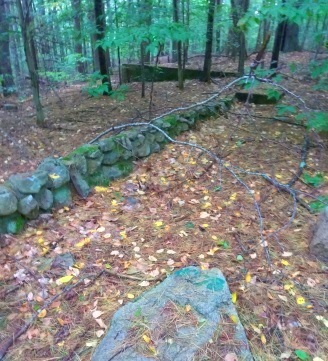 The trail will pass the remains of a foundation and then will pass through a rock wall. Just after it will start a moderate decline. Soon it runs midway along the hillside passes another rock wall and levels running through what appears to be much glacial till. It continues this way rock strewn with course gravel and at 2.19 miles the trail starts to climb continuing rough. It levels again and passes through another rock wall. There will be a slight turn to the left and declines, the way becomes easier but still rocky. Leave the loop trail the same way you entered. At 2.36 miles we arrive back at Picture Pond. Follow back along the pond and over the bridge out to the kiosk which is where MH1 is marked at 2.63 miles. If you are camping, hike another .80 to one mile back the same route to arrive there and finish your hike. An alternate way to the campground is the Trail to Holly Pond in reverse. If you parked at Mount Blue Spring or would like a more interesting way to hike back another alternate way is to use the hiking trail at S19 to the right. This has the more lengthy boardwalk. 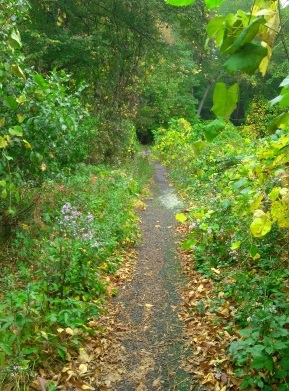 Following this trail that starts with the boardwalk and leads to the right, the trail runs along narrowly and follows close to the street. It ends just across from the trail that leads into the east part of the hiking trails marker E1. From here take a left and the parking area for the spring is just a few short steps away! Look at Wompatuck State Park for directions to the park.